The Bourgault 3710 Independent Coulter Drill is the most revolutionary coulter-style seeding system on the market with size options and many innovative design features that set the 3710 ICD apart from the competition. Parallel Walking Coulter Arm Assembly - This advanced 1:1 parallel link design ensures accurate seed placement for many trouble-free seasons. Contour-Ability & Consistency - Achieve consistent seeding depth in rolling land with a 1:1 parallel link design with minimal sensitivity to debris and existing seed furrows. INCREASE Your Efficiency - The 3710 ICD is available in unit widths of up to 60 feet (18.3 m)! The 3710-60 is available with the hi-flotation design option. 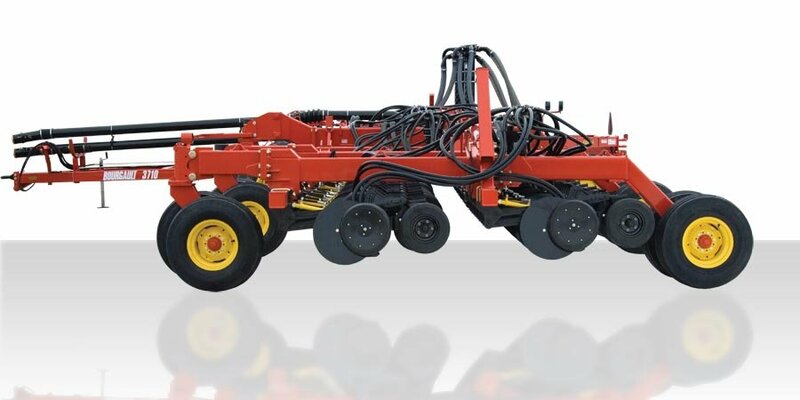 Variety of Spacing Options - The 2-row Bourgault 3710 Independent Coulter Drill is offered at 7½" (190 mm), 10" (254 mm), and 12" (305 mm) spacings, with the flexibility of a row-crop spacing on the 7½" (190 mm) and 10" (254 mm) spaced models. On-The-Fly Hydraulic Control - The Model 410 Control Box provides precise electric-over-hydraulic control so you can make adjustments as your conditions change. Low Disturbance Seed Boot Scraper - The low disturbance seed boot scraper creates minimal disturbance to ensure precise seed placement and maximize moisture retention. Choice Of Packer & Cleaner Wheels - You can configure the 3710 ICD for your specific requirements. Series III Mid Row Banders - Achieve the best possible returns by placing your nitrogen fertilizer in the optimal location when one-pass seeding. Hi-Flotation option available on 3710-60.